This MINI fuse kit lives up to its name. The kit contains 10 pieces each of 4-30 amp fuses and will fit in the palm of your hand, making portability and easy storage possible. 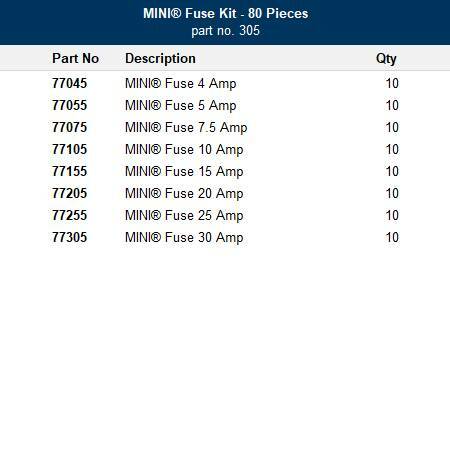 There are 80 pieces total and each color-coded MINI fuse. Organization that fits in the palm of your hand. This kit contains 80 total pieces of 8 different color-coded, fast acting, MINI fuses. 10 Pcs each of 4-30 amp fuses. All contained within a durable, lightweight, translucent plastic carrying case (4-1/2" x 2-5/8" x 1-5/16"). 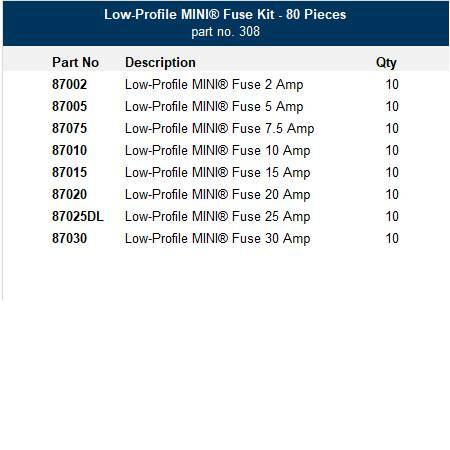 The Low Profile MINI fuse kit is an 80 piece fuse assortment of low profile MINI fuses. The kit contains 10 pieces each of 2 to 30 amp fuses. The assortment is packaged in a tough plastic storage container perfect for the parts drawer, tool box, under counter or road service vehicle.